After some helpful tips for flying with baby? Travelling with a baby is usually associated with stress and a lot of the time we tend to imagine the worst that can happen. Like baby screaming constantly on the plane, is the flight going to be too long or million other negative thoughts that we can come up with before we even fly! Some families opt out to wait till the kids are older, in hopes that it gets easier… Well, that is totally up to them. We have travelled with our kids right from the start. By the age of 9 months Avalee-Rose (our youngest of three girls) has been on 14 flights already and we cannot wait for our upcoming trip to France, which is coming up in four months! 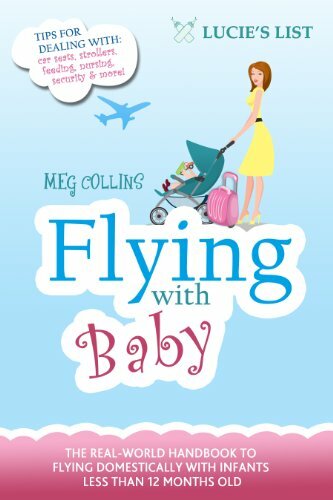 Flying with a newborn baby doesn’t have to be scary! I think we all get some level of nerves before an impending overseas trip! We all have a nervous moment where we wonder if we have organised everything we needed to! Sometimes a little traveling with baby checklist can help take away the anxiety!! So please feel free to grab this checklist as a printable! How do we do it? The answer is simple! We prepare! We follow our own checklists and get all of the essentials ready way before we fly. That way, the actual flight itself is that much more organized and we can even watch some in-flight movies. 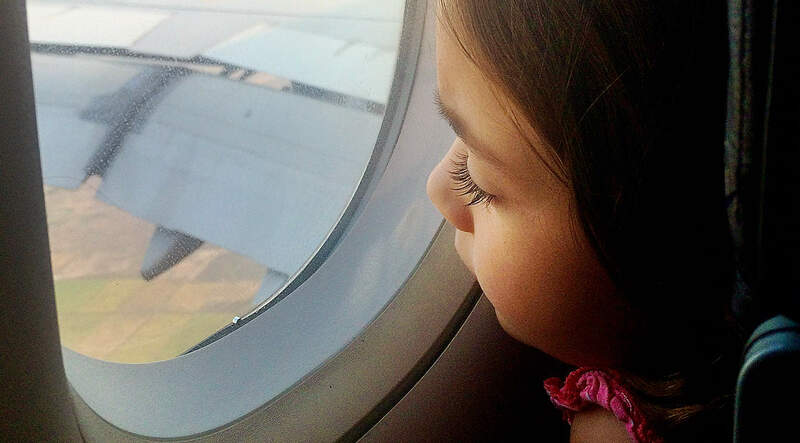 Sounds good?… OK, let me share with you our top 10 tips for flying with baby love! I will also share with you essential items that we specifically take along for the flight. You can click here to find a list of our other best baby travel accessories that we take along on our trips. Try to book the most direct flight and one that aligns with baby's sleeping patterns. When you are flying with an infant on your lap you must take into consideration how long the flight will be. Try to find a seat that will give you extra room (you might need to pay for these). Make sure to book an aisle seat so that you can move about freely! You will most likely do a fair bit of walking and bouncing, so quick access to get up is really essential! I always make sure to contact the airline, at least a few weeks before the flight, to confirm that we have the right seats for our family. Usually, it is hard to get all the seats in a bassinet row for all of the kids, but if that is possible, then your whole family will enjoy a flight together. Thankfully Lily and Katie are older now and they don’t require as much attention as Avie does. In-flight entertainment helps to keep them amused. Having the right seat is important and can help when it comes to getting your baby or toddler to sleep on the flight. There is no set age restriction on flying with a newborn baby. Do babies fly for free? Babies age 0 to 2 years old are charged a much cheaper rate! Click here to see the prices sorted according to certain airlines. All babies need passports for international travel. Click here to see a fabulous post containing guidelines on how to apply for a passport for your baby. 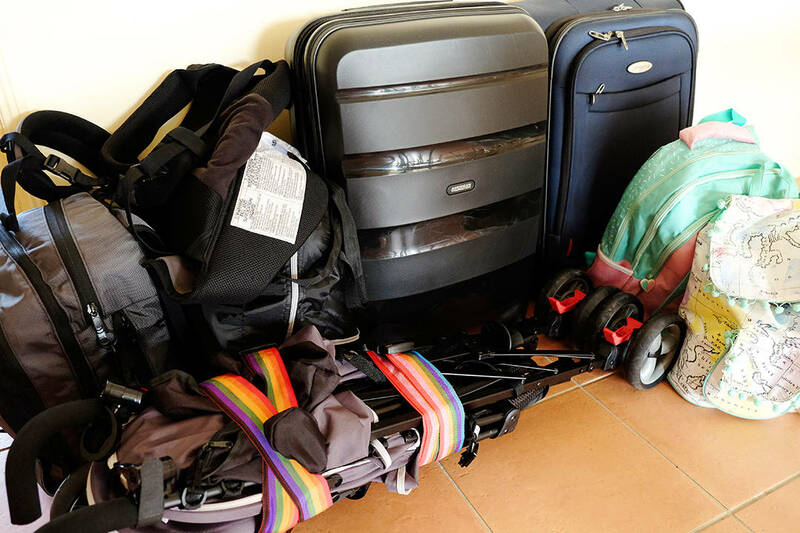 Choosing the right baby carry-on luggage can be a headache! Trust me, I know from experience! There are so many styles, designs, and varieties! From your typical baby suitcase, a baby travel bag to a baby carry bag. There are even options of ride on luggage for toddlers. Yes, headache!! These days I am a proud owner of a DadGear backpack diaper bag! Yup, you read it right!! This is the coolest baby travel bag that money can buy and the best backpack that I have ever had! Not only does it fit everything that our little one needs, like the essential nappies, bottles etc. But it also has plenty of space for clothes, blankets and all of the other things that you can imagine. For example, I carried our cameras, a selfie stick and even our water bottles in it. So much space! Being a bloke, no one knew that I was carrying a diaper bag. 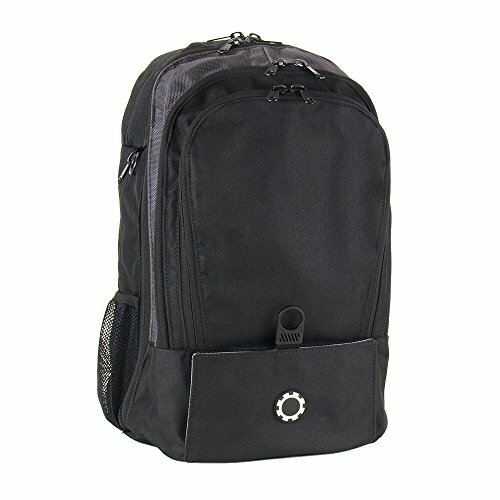 DadGear diaper bag looks like a normal backpack. When Avie was in my ErgoBaby pouch positioned in the front, the backpack balanced out the weight, so I could walk all day without a sore back. And lastly – hands-free!! Yup, the last thing you want to do is to pull along or drag extra children carry-on luggage when flying with kids! 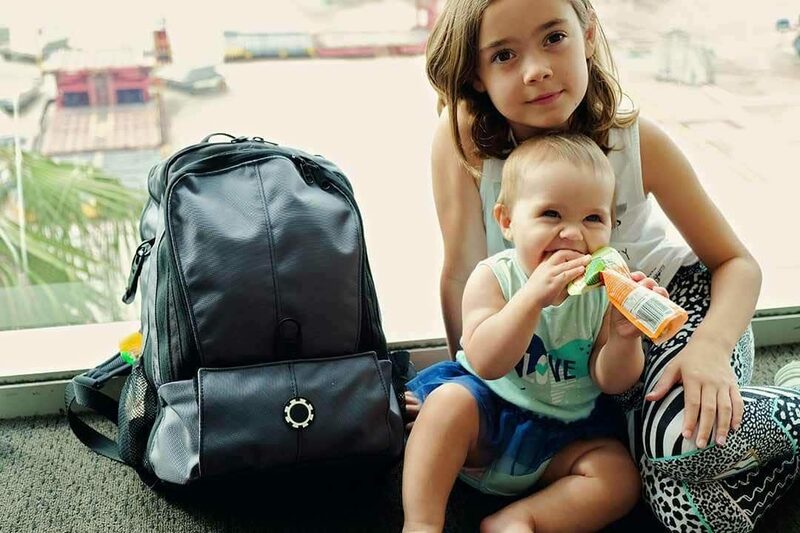 Click to read our post on the best diaper bags for travel. When you are flying with a baby you need to take everything that your baby may need. Obvious choices are of course, diapers, spare clothes, bottles and formulae etc. It is also a great idea to pack your own airplane snacks for toddlers. Watch this video below to see what we take on long-haul flights for our baby. Let us know what your travel experiences are with your DadGear backpack!! I have no doubt that you will love it just like we do!! Your FREE Printable Baby Travel Checklist of what to Pack! 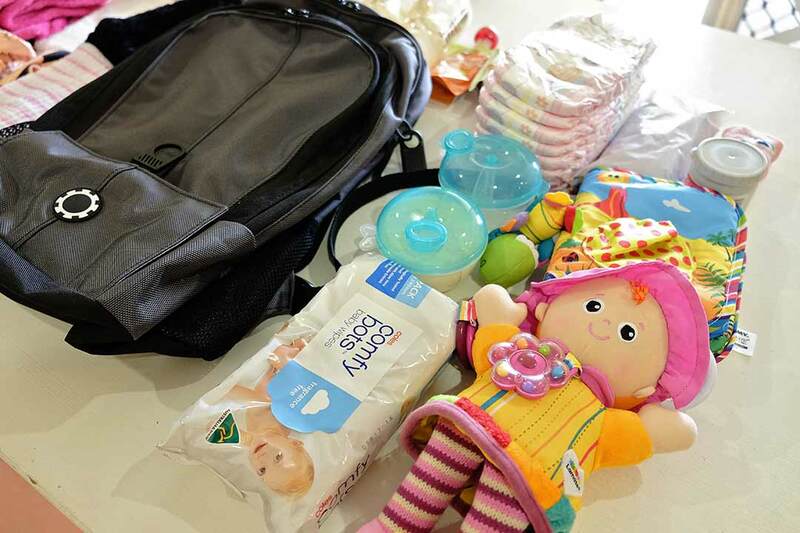 There are a number of baby essentials that you can take with you on the plane for free!! Apart from the check-in luggage, you can bring a travel pram, baby travel cot and a travel car seat! When we went on our travels to Japan, we opted in for the smallest pram that we could find! 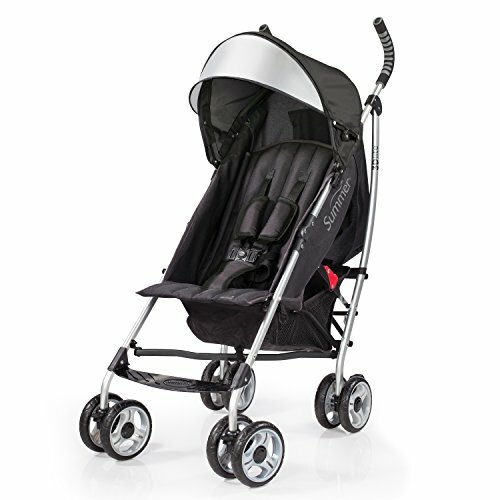 This type of travel pram folds really easily, it’s easy to carry around and above all, it is light weight! A baby travel cot is essential!! I assume, that like our bubba, your baby is used to sleeping in her/his own bed, so having their own personal cot that you can move around from hotel to hotel is a very good idea! That way your bubba can get used to her/his new bed quickly and you will have good night sleeps on your holidays wherever you go! 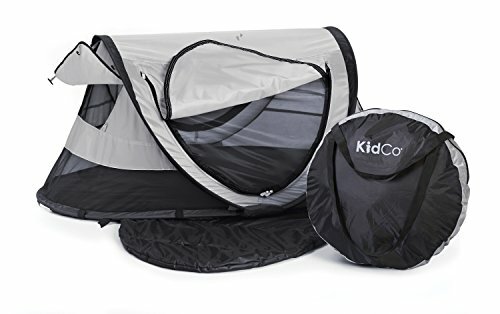 If the destination that you are going to has smaller size rooms, we recommend you chose the Kidco PeePod pop up tent. We used it in Japan and we loved it! It was great to be able to close the zipper for safety and pop a shade cover over the openings, so we didn’t have to dim the lights. That way we enjoyed the rest of the night the way we wanted. Alternatively, we do recommend Phi&Teds Traveller Travel Crib. This kids porta cot is perfect for any holidays. 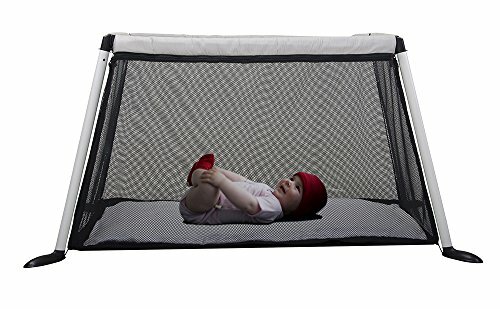 Just like a previous kids travel cot, this one folds to an easy-to-carry lightweight and is small in size! Having your bubba sleeping in their own travel cot also significantly increases the chances of romance for the adults! When you are traveling to a country where you will be doing a lot of driving, we would recommend taking a convertible car seat as well. This is, of course, free to check in to baggage. We do though recommend that you book an extra seat for your baby or toddler if you can afford it so that you can take the seat onboard. It is much safer for a baby to sit in a car seat rather than on the lap of a parent. 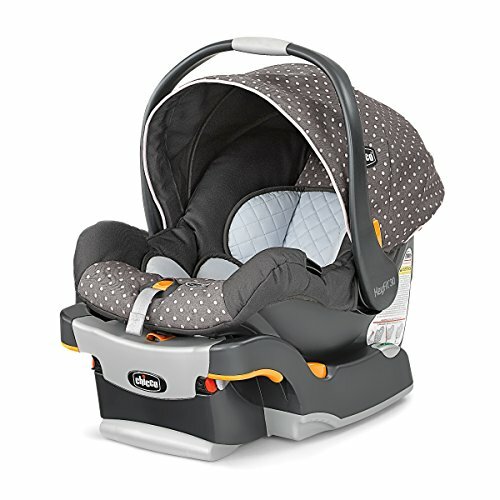 You can find our helpful guide on FAA approved car seat here, together with helpful information on how to fly with your car seat here. When you are booking a spare seat for your bubba, the majority of the airlines do recommend to bring a car seat with you. 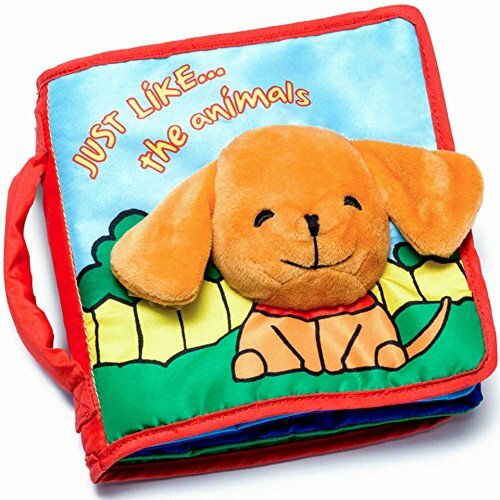 It is a much safer option for your little one to sit, eat her/his meals in and to play in! Of course, should the baby bassinette seat be unavailable, this is a better place to sleep in! That way, if you are flying overnight, you are able to take a much-deserved nap as well! Ps: Make sure to bring a car seat bag for the airplane as well. That way, when you are not using the seat, it is easier to carry around! Flying with a car seat and stroller makes life easier in the long run. We always walk a lot on our adventures and in many of the countries, we love to hire a car as well. Having your own things can save you a lot of money! 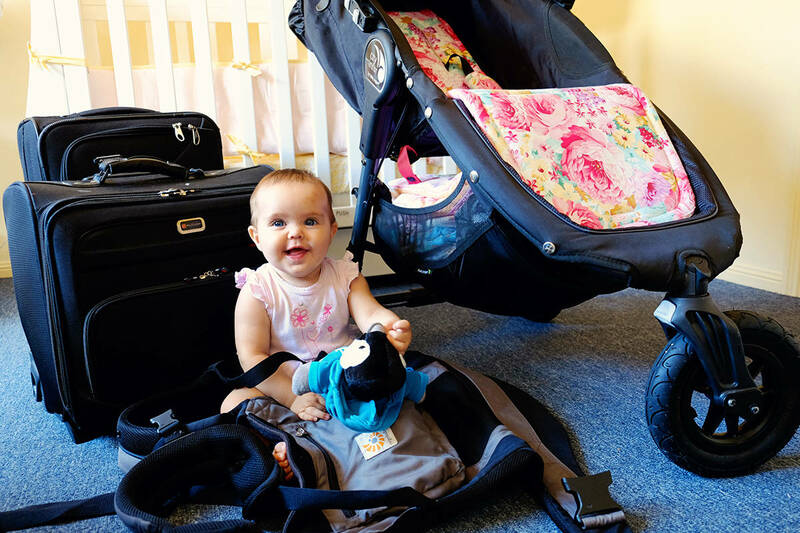 Once your travel stroller and the rest of the luggage is already checked in, the best way that I found to move around the airport, board the plane and transit between flights, is when Avie was in her super comfy Ergobaby carrier! Your hands are free to do other things, like hold your other kids' hands, drink a coffee and show your passport and boarding pass. 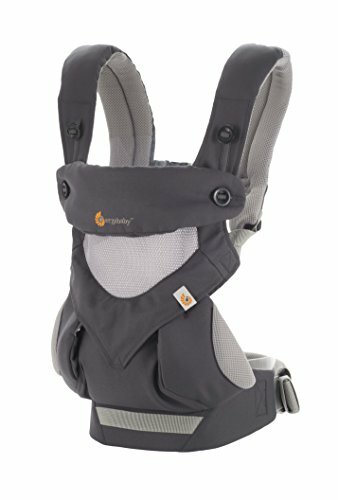 Award-winning New version of Ergobaby carrier is even more comfortable for your little one!! I have to say, our Ergobaby pouch is one of my favourite things that we travel with when travelling with our baby! I know she will grow out of it soon, but until that happens, these are very special moments for me. When she sleeps on my chest and her little hands are wrapped around me… it’s simply magical!! Obviously, you need to take some travel toys for when you are flying with a toddler. 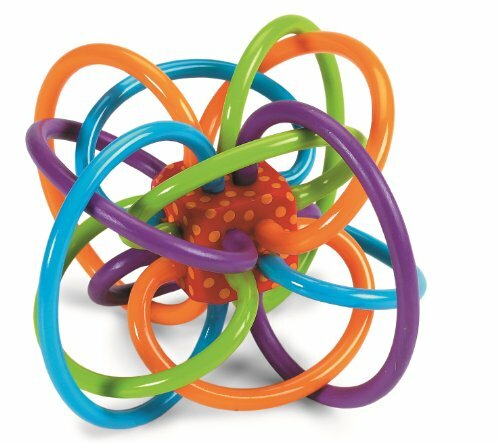 If your little one is teething, then you need to take some kind of teething toy for munching on. Squishy toys are great for snuggling to and any kind of colourful distractions are awesome as well! I wouldn’t overload your backpack with too many airplane toys. One of each is great and rotating the play time with them for a bit of novelty is always a good idea. Having a few soft books for babies can be really rewarding. Not only your baby is occupied with it for a certain amount of time, but also you have an opportunity to teach your baby love some new sounds. We found some books for newborns to have simple pictures of animals or letters. That way you can start creating some visual recognition and sound association between the pictures. I find it awesome!! I love seeing our baby learning. Interactive books for kids are great toys, unlike a lot of the toys that we clutter our living room with. It’s so much fun to see our little one figure things out and get excited when she does something right. Recently Avie started to make up more sounds… Mama, Dada and Baba are amongst the many others. Very proud. After more ideas of what to pack for your toddler? Here is a great post full of ideas of great toddler travel toys to take along. 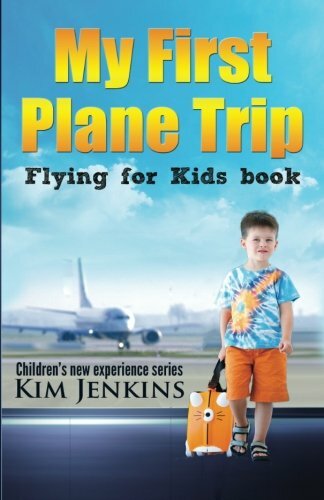 Best books for flying with kids? Check out some great books on Amazon here! The easiest way to feed your baby when you are flying is to simply breastfeed. That way the milk is always ready and warm for bubby. Make sure if you are breastfeeding to take a light coverup and that you have something like your neck pillow to support your elbow whilst you hold bubs. Here is a great post containing more tips about breastfeeding whilst travelling. If you are choosing to bottle feed, make sure you have the bottle ready to go prior to take off. We prefer to buy room temperature water from one of the airport shops, so we can fill up baby’s bottle without having to annoy the air hostesses (they will be pretty pre-occupied with their job of aiding the passengers board). You can take a bottle of water through security if it is for baby, but we find that the process is just so much more simpler if we don’t have any liquids and we grab a bottle after we have moved through security. Travelling with a baby on the plane is sometimes a bit more work, but changing a nappy on the plane is not a drama at all. Maybe lining up to the toilet will take you a bit of time as there is usually one changing table in each section of the plane. I suggest you suss out which one it is, before the long flight, so you can get there faster. Take warm clothes!! It doesn’t matter if you are flying over tropical islands where the sun is warm and the sand is hot. On the plane it can get a bit chilly. Even though, the airline usually supplies you with a baby blanket, having the right baby clothes will keep your bubba nice and snug! We always try to find the comfiest clothes for the plane. The more flexible the material is the better. The last thing you want is to dress up your little one in fancy clothes for the plane. 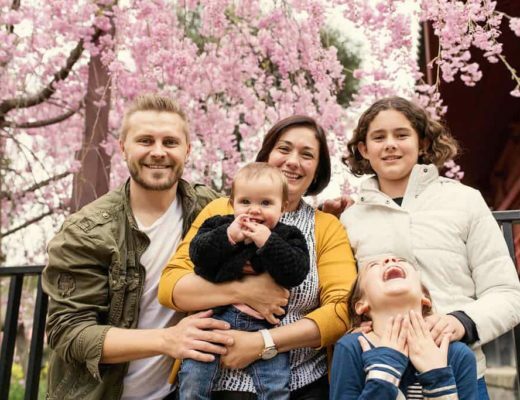 Although your bub might look super stylish with little jumpers, jeans and tiny little shoes, the best clothes for flying are the ones that you can change quickly as well. Remember the section about the tiny toilet cubicle and sideways change tables? OK then, let's move on. 10. Wondering what to pack in the baby suitcase? I know that flying with a baby can be scary even before you step on board the plane. However, if you prepare yourself with all of the above, the actual flight experience can be more like smooth sailing! 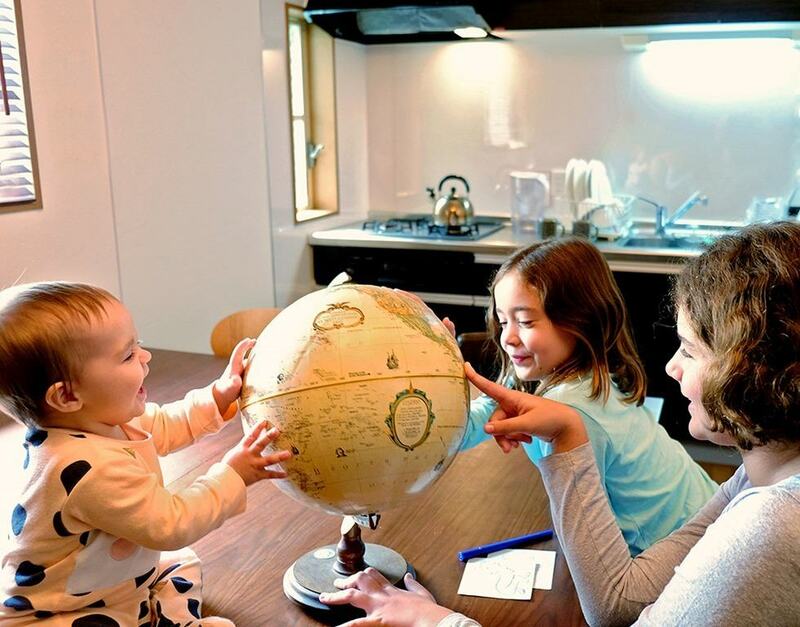 If you have everything packed and within reach, you and your little one will have a great time together and just like us, you will look forward to the next trip!! Added bonus; next time, you already have everything!! After more ideas of where to go next? 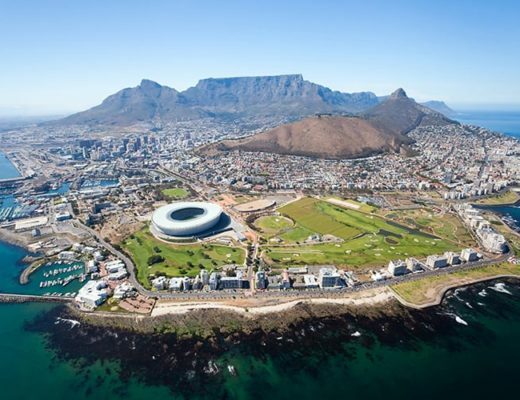 Here is our guide to the best places to go with baby in tow. Printable Checklist when you sign up to the Newsletter! 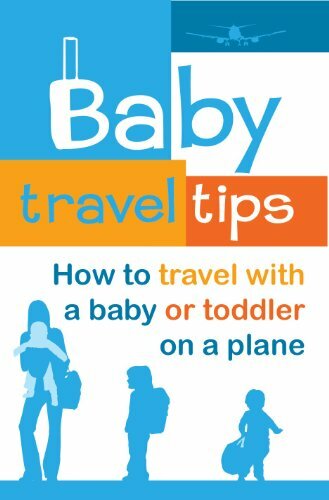 Which of the points on our list of Tips for Flying with Baby Love was the most helpful for you? If we have missed some tips, please share them in the comments below! Thank you! Just a little update on fees for babies on domestic and international flights (Australia). As of 15 May 2017 fees will be added to domestic $30 and international ($50). Check in baggage for babies is still free. oh really!! We just missed the new fees! Not sure why there should be fees (even if it isn’t very much!)! But I guess they can do whatever they want and we just need to pay grrrr. Thanks for letting us know! These top 10 tips help parents to travel with their newborn babies. Also, this guides helping them to begin to end how they go forward. I Appreciate your article on the Dadgear diaper bag. It is sturdy and durable and also more storage diaper bag than others. thanks again. I use backpack diaper bag to travel with my child. I carry all my necessary baby accessories in my backpack diaper bag. And it is easy to carry comfortably on my back. 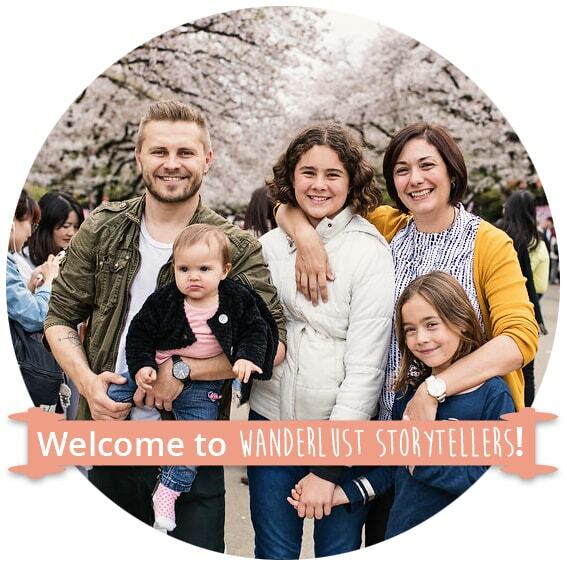 Thanks for sharing some of your favourite diaper bags with us.